This is the third installment in a series of albums by Polish Jazz pianist / composer Kuba StankiewiczFind albums by this artist dedicated to the music written by the composers of Polish / Jewish origins, who are known primarily as the great American composers of many Jazz standards, and their true origins are almost completely unheard of. Same as its predecessors, which were dedicated to the music of Victor YoungFind albums by this artist ("The Music Of Victor YoungFind albums with this title") and Bronislaw KaperFind albums by this artist ("The Music Of Bronislaw KaperFind albums with this title"), this album was recorded by the piano trio with Polish (resident in US) bassist Darek OleszkiewiczFind albums by this artist and veteran American drummer Peter ErskineFind albums by this artist and presents this time eleven compositions by Henryk WarsFind albums by this artist, including his most famous standards and a few much lesser known pieces. 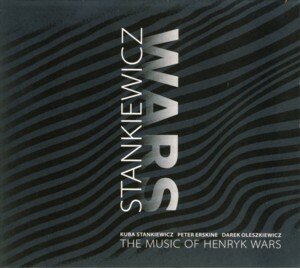 Stankiewicz, as usual, took great pains to conduct a serious research about the composer´s life and music before he selected the compositions included on this album. He is definitely quite a perfectionist in what he does, and this deserves our outmost admiration. The album includes a very educational write-up about Wars by Marek ZebrowskiFind albums by this artist (in Polish and English) and the album´s artwork continues the design originated on the previous albums. In short this is a very professional and highly aesthetic piece of music production in every aspect.